Cameron Smith has recorded his best finish this season in the US with a 4th place at the Porter Cup in Lewiston, New York. Smith, the 2011 Australian Stroke-Play champion, finished at 10-under-par with rounds of 71-67-63-69, seven strokes from winner American Richy Werenski. Werenski claimed his first top amateur US title with rounds of 66-62-67-68, for a two stroke win over fellow countryman, Denny McCarthy. Patrick Rodgers finished in 3rd position at 13-under-par. Matt Stieger came home blazing with a final round 66 to finish in a tie for 5th at 9-under-par after earlier rounds of 67-69-69-66. 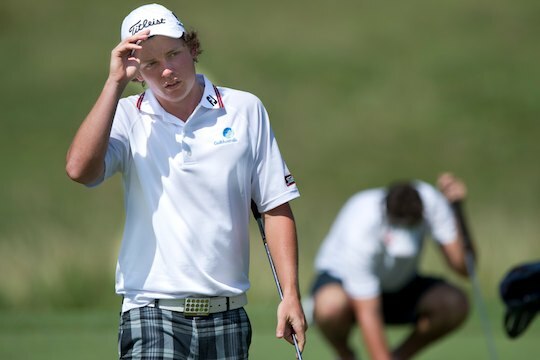 This is a stellar result for Stieger, who headed to the US with fine performances in the UK, making the cut in every event he entered, including a quarter-final appearance in the British Amateur at Royal Troon. Ryan McCarthy finished a stroke behind Stieger at 8-under-par with rounds of 71-69-65-67 to record a fine top-10 result finishing in a tie for 7th position. Nathan Holman, who showed early promise at this event after finishing the opening round in a share of 4th position, fired a final round 69 to finish at 2-under-par and in a tie for 23rd. Holman’s third round 74 damaging his chances after opening rounds of 66-69. Jake Higginbottom, our highest world ranked amateur, fired rounds of 73-71-66-79 to finish in a tie for 27th position. Higginbottom’s overall result this week was a little disappointing and he will be looking to improve on recent performances particularly with the two big events – the Western Amateur in a fortnight in Chicago and the US Amateur next month – on his schedule.